It’s almost a must-win situation for the Oklahoma City Thunder when they return home to host Game 3 of their NBA first round Playoffs series against the Houston Rockets. Join The Roar for live scores and coverage of the match from 11:30am (AEST). The Rockets, who took third seed in the tough Western Conference have made no mistakes to start their charge at a championship, taking both games at home. While neither saw the exciting Houston club play at their best, they did more than enough, particularly in Game 1, to keep Russell Westbrook quiet and take victory. Game 1 was almost a fizzer given the lofty expectation riding on the series before it got underway. 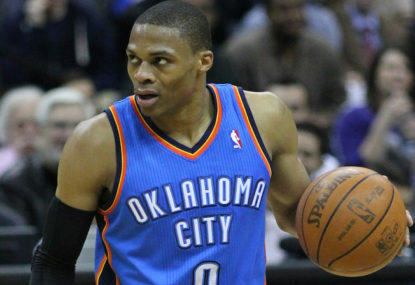 Westbrook struggled to get his side into the game and while he still top-scored, the Thunder were blown out by 31. James Harden was dominant for the Rockets, but the amount of support he had from teammates was evident and could prove to be the difference going forward. That support was led by point guard Patrick Beverley who winded up with 15 points, six rebounds and four assists. The Thunder had to turn things around in Game 2, and to a large extent, they did. However, with only Westbrook to provide the go forward both in the contest and on the scoreboard, they were always facing an uphill battle. The game was a little more of what was expected from the series, with the Rockets nudging out a 115-111 victory. Points and attack was the order of the day for both clubs, with Westbrook putting up a 50-point triple-double – the first in finals history. While it has been quite rightly celebrated, the numbers its made up of might show a part of the Thunder’s problem. He shot just 17 of 43 from the field, which is simply not good enough, particularly when you consider Houston are rebounding out of their skin so far in the series. It’s rebounding where the Thunder were supposed to have an edge, and they haven’t so far. It’s hurting them on the scoreboard, and with all the second chance points, Harden and the fast-running Rockets are making them pay. While the Thunder got close in Game 2, the men from Oklahoma City are going to need to do more here if they want to stay in the series. Others should lift being at home to support Westbrook, but whether it’s enough to stop Harden, who should take over on the road is another question. It’s all going to depend on Westbrook. The Thunder aren’t going to get swept out of the playoffs though, and he should do enough to get them over the line and on the scoreboard here. Be sure to join The Roar for live coverage of the match from 11:30am (AEST) and don’t forget to add your own comments throughout the course of the coverage.